‎Does this make you feel as squeamish as I suspect it does? Processed food always makes me queasy. Ugh. We used to take cheez-whiz while backpacking for lunch--it was processed cheese in a squirt can. It didn't look quite that bad! "Fromidable!" made me laugh. But I still wouldn't buy it. I had to laugh too, and I would say no way to it too! 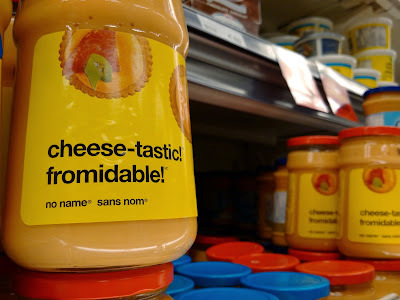 I suspect the "fromidable" is an attempt to translate to French the "cheese-tastic". Neither sound particularly appetizing. I like the 'fromidable' tag-line, but it isn't my thing. It reminds me of that weird spray cheese and toothpaste tube cheese which I've seen in America.